The sale of 71.9 acres of the Harner Farm property in Ferguson Township was completed in November, and on Tuesday, developers presented a concept plan for residential and commercial parcels on a portion of the land along West College Avenue and Whitehall Road. The concept plan presented to the township planning commission proposes a Sheetz, a mixed-use building with retail, offices and apartments, and 36 single-family residential lots, all on 26 acres on the southwest side of Whitehall Road. The area also includes a parcel with a family home still owned by the Harners. The mixed-use building is "in conceptual form" and only a possibility at this point, said John Sepp of PennTerra Engineering. However, Justin Mandel of developer Aspen Whitehall Partners LLC said preliminary discussions are under way with a bank, another food business "that's not a competitor with Sheetz," and a "medical use," the for 20,000-square feet of retail and office space. He added that the space could be divided in a number of ways and could include more tenants. Aspen Whitehall requested the discussion of the concept plan in order to receive feedback before it submits land development plans, according to Ferguson Township Director of Planning and Zoning Raymond Stolinas. Sepp said the developers hope to break ground in 2019. Plans for the other 45 acres to the southeast side of the property -- where the Harners will maintain the market and two family homes -- have not yet been discussed. In the meantime, the Harners will continue to lease and farm that land. The Harners also are keeping 34 acres southwest of the concept plan area, along College Avenue and bordering the Russian Church of Christ, where they will continue with a downsized fruit and produce production. Concept plan for commercial and residential development of 26 acres of the Harner Farm property. Image: PennTerra Engineering via Ferguson Township. At the request of the Harners and Aspen Whitehall, township supervisors in June approved rezoning the land from all rural agricultural to 27 acres of commercial and 44 acres of R-1 single-family residential. That came after a rezoning request was denied in September 2017 because of concerns over the initially proposed 44 acres of commercial zoning, as well as the density of proposed R-2 zoning. R-2 was removed entirely and commercial was reduced in the approved rezoning. The sale to Aspen Whitehall for $5.6 million was completed on Nov. 16, according to county records. 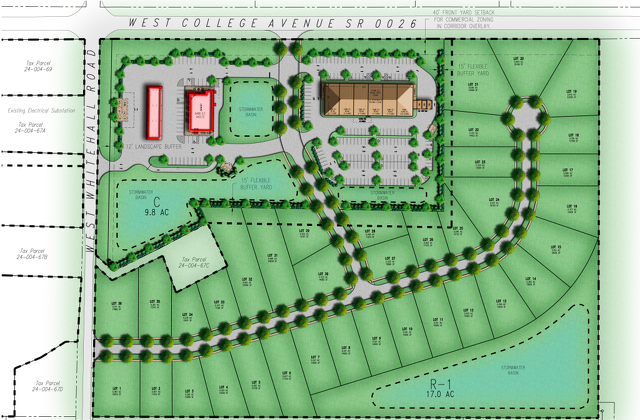 According to the concept plan presented on Tuesday, which is not final, the Sheetz and the mixed-use building would be constructed with frontage on West College Avenue. The single-family homes would be on lots ranging from .25 to .50 acres. Two new public roads would serve the area. One would connect to West College Avenue about 500 feet from the College-Whitehall intersection. The other would connect with Whitehall and terminate in a cul-de-sac within the residential area. The two new roads would intersect within the residential area, and Sheetz would have its own access to and from Whitehall Road. Sheetz would have a 6,077-square-foot building on 5 acres, with a drive-through, gas pumps and 47 parking spaces. Brian Dinges, real estate site selector for Sheetz, said the company also would seek to sell beer and wine at the location. In-store seating also is integrated to give it more of a restaurant feel. Dinges said the design planned for the location is the larger of two new models Sheetz currently builds, the other being 4,983 square feet. "They are the only two stores that are currently being put on any footprint throughout our six-state region," he said. "They are identical in terms of offer and exterior elements… one’s a smaller version than the other." It would be identical to the rebuild planned for next year of the Sheetz at Shiloh Road and Benner Pike in College Township. Planning commission member Jeremie Thompson expressed some concern about drive-through backups during peak times. Brent Brubaker, engineering permit manager for Sheetz, said that drive-throughs, where they're available, are offered as a convenience but only account for a small portion of Sheetz business. "We roughly do about 10 percent," he said. "If you compare that to a McDonald’s, McDonald’s does about 70 percent of their business through a drive through." He added that there is more than sufficient room for stacking vehicles and signage will be in place to prevent blocking of intersections. Responding to a concern from planning commission member Lisa Strickland that 47 parking spaces might not be sufficient if patrons are coming into the store to sit down and eat, Dinges said turnaround for diners is still fast and people who sit inside to eat often do so only because they don't want to eat in their vehicles. "Our sweet spot is 36 to 40 parking spaces," Dinges said. "That’s really what we need to operate where we want." The Sheetz would be the 10th in the county and seventh in the Centre Region, though it would be the first in Ferguson Township and the western part of the region. "I know some may well have angst with regard to another service station, but Sheetz is so much more than a service station with regard to their product that I don’t have that much angst personally at this point at having another… I’m reluctant to say another gas station because Sheetz is so much different than a gas station," planning commission member Bill Keough said. "Its product has been well tested in Pennsylvania and it's doing well." For the overall site, Sepp said several locations have been identified for stormwater management, though they have not yet been designed. He said Sheetz and the rest of the site will be able to comply with any conditions in the source water protection overlay ordinance currently under consideration by the township. A traffic study will be conducted for the site, meanwhile, to answer further questions about entry and exit. "I have a lot of questions about this traffic flow coming in and out of Whitehall and College that won’t be able to be answered until we see the traffic study," Strickland said. The Harner family has owned the farm since 1945. They will continue selling their popular fruit, produce and cider but are downsizing production to the 34-acre parcel to the southwest. During rezoning discussions earlier this year and last year, township supervisors noted that because of the growth around the farm, which already is surrounded by commercial and residential, it likely would be impossible for the Harners to sell the land to another farming operation or to continue farming the entirety of the property. The property is within the regional growth boundary, and since 2000, it has been designated as mixed-use in the regional comprehensive plan land use map. Dan Harner told the Centre County Gazette this week that he believes the farm is moving in a positive direction. “It’s one of those things where this place has been here for a long time, so it’s a pretty big change, but I think it is just the nature of the growth of Centre Region. It is kind of hard to do the farming we do with all the traffic that is on West College Avenue, and kids riding bikes and jogging,” Harner said. Harner said they will start to focus on a “pick-your-own style” of fruit sales because finding fruit pickers in the area is a challenge, but they will still sell Harner apples and produce at the market on College Avenue. He also said that apple trees are smaller these days and take up less land, so he plans to see production continue nearly as it has. 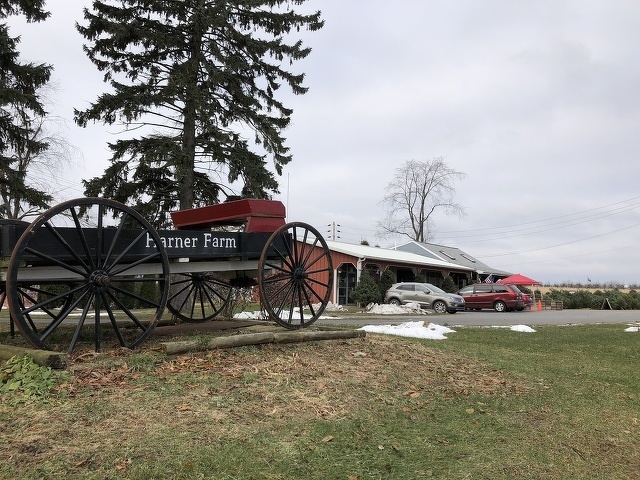 Eventually, the Harners will set up a production center on 34-acre parcel, but for now they have a two-year lease agreement to farm and use the property near the market, so the corn maze will still be a go next fall, he said. Centre County Gazette's Vincent Corso contributed to this story. 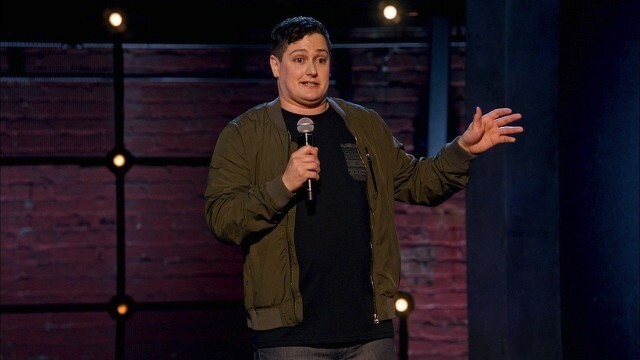 Comedian Joe Machi, a State College Area High School and Penn State graduate, will make his "Tonight Show " debut on Thursday (Dec. 6) night. Back in April, Machi performed on "Conan," Conan O'Brien's late-night TBS show, for the first time.